7. The 'A' Series (post-1951) and Kerryl (post-1956). Evidence for dating the numbering series. The dates adopted throughout this catalogue (as listed above) vary in their reliability. Some are rock-solid, others derive from surmise and assumption. Rather than hedging about a date whenever it is mentioned in the catalogue, the dates listed above are treated as 'The Truth' and the credence that should actually be placed upon each is discussed at more length below. This page probably won't concern every collector but is intended for those interested in Premier Pottery's history. If you uncover facts that have a bearing on dates we'd be delighted to hear from you - please contact us. Future revisions of the catalogue may well see changes. It is assumed that numbers were added to each series in sequential order as new shapes were introduced. This necessary assumption is clearly reasonable and consistent with the data, but is not actually verified by any direct evidence. Some pieces with the Remued signature are dated. Dates are 1933 and 1934. No piece is known dated 1932, implying that the Remued name had not yet appeared then. About half of all Pamela pieces are dated, and in every case the date is 1934. None is known dated 1933 or 1935, implying that the Pamela name was not in use then. The very strong inference therefore is that Pamela production began and ended during 1934. The relative scarcity of Pamela pieces is consistent with such a short production life. Two pieces are known where a 'Pamela 1934' inscription was washed off the base and replaced by 'Remued', implying that the demise of Pamela occurred in 1934 (see Pamela Series 14). New numbering assigned to the Pamela shapes that re-emerged as Remued are within a range of numbers known to have been current during 1934, mostly in the later part of that range from about 140. There are quite a few un-numbered pieces dated 1934, both Pamela and Remued, including shapes for which numbered examples are recorded also dated 1934. The clear inference is that numbering was introduced during that year. Pieces with both a number and a date are rare but every one is dated 1934. The highest-numbered recorded example is 196 but a shape-book entry for 201 shows a jug commemorating Victoria's 1934 centenary, indicating Early Series numbering reached at least 201 during 1934. Pamela numbering only reached about 31 before the Pamela name was discontinued. Most PPP pieces are un-numbered, but some do have numbers and those numbers form part of the Early Series sequence. (Discovering this came as something of a surprise.) PPP numbers all come quite early in the numbering, none being recorded above about 150 which is within the range known to have already existed during 1934. The production of PPP pieces must have ceased soon after numbering began because numbered pieces are rare. A surviving fragment of a carbon-copy from an order book dated November 1940 shows that Early Series numbering was definitely still in use then. 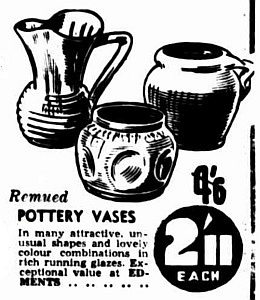 Some months later in March 1941 a newspaper advertisement still shows Early Series shapes, and an advertisement showing an Early Series shape is known from as late as July 1942 although perhaps that was old stock or an old printing block was being re-used. At some point after early 1942 however, new wartime regulations required all manufacturing industries to switch to purely utilitarian goods. The switch is seen in Remued production, with a marked change from decorative to utilitarian items from about Later Series 65-68 onward. It would seem therefore that lower-numbered Later Series items were already in production before the change came into effect. Furthermore, the 500 Series had been sandwiched in between the Early and Later Series, so while the exact date for the end of the Early Series is unknown, it clearly happened during World War 2 in 1941 or 1942. * the Later Series took over. These events are discussed further under each separate Series; links at top of this page. A set of four photographs dated October 1950 shows many Later Series shapes. Every shape comes from the beginning of the Later Series, ie before the onset of wartime regulations, within the number range 1 to 69. Curiously no shape introduced afterwards is shown, not even those that are relatively common. Certain 1 to 69 shapes are missing too, including every number for which no example has yet been found for this catalogue. Although these photographs don't really add new conclusions to the dating story presented here, they are consistent with the story and do at least provide a firm documented date. A surviving page dated November 1954 shows handwritten orders for two Melbourne suburban shops. Items are identified by their Later Series shape numbers. Every item specifies 'white', except for numbers 6 and 55 - both ashtrays - which specify 'coloured'. A price list dated October 1952 covers 'A' Series A1 to A26. The document is typewritten on the letterhead of Burmatt Pty Ltd, "Distributors of Remued Hand Made Pottery". This is the only dated documentation for the 'A' Series and shows that the series and its numbering were in production concurrently with the Later Series. The name 'Kerryl' however does not appear on that document, suggesting that it was not yet in use. This is consistent with the supposition that the name 'Kerryl' dates from the establishment of the new pottery at Reservoir in 1956-57 after Premier closed. 'A' Series numbers beyond A26 were introduced later and began to include some slip-cast shapes. Later Series 129 is labelled in the shape book 'Mug, Migrant Camp', reflecting the start of postwar immigration. Shortly afterwards decorative pieces make their re-appearance, both new shapes and revivals from the Early Series, so clearly the wartime restrictions had been lifted. Both these factors point to the Later Series numbering having reached somewhere around 130-140 by late 1945. Advert for Edments gift shop in the Hobart 'Mercury', March 1941.